Are you tired of the Olympics already? Are you tired of U.S. presidential election news? Are you bogged down with back-to-school preparations? Then maybe you need some lighthearted distraction! Of course, you'll always find interesting and informative posts at mental_floss, but in addition, here are some wacky and oddly specific blogs that might bring you a smile or two during the hot month of August. Let's Polka is a blog about "all things accordion." Ha! You thought I was going to say it's about polka music, right? Yeah, those things often go hand-in-hand, but if you enjoy accordion music, play one, or are thinking about taking up the accordion, you'll want to read this. Let's Polka, by Anna and Chris Saccheri, isn't updated very often, but has a lot in the archives. 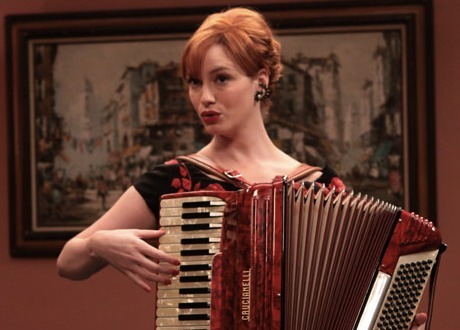 Pictured is accordion player Christina Hendricks. 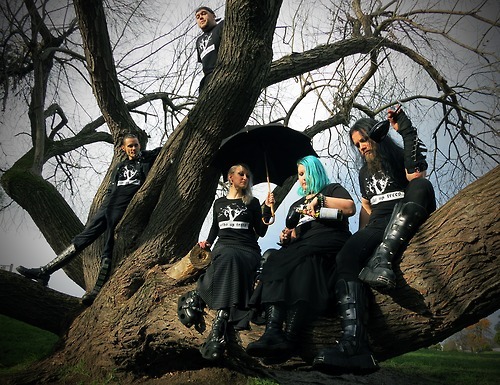 We told you earlier about the blog Goths in Hot Weather; now you need to check out Goths Up Trees. Goths Up Trees is run by the blogger known as Verity or changelyng. Goths submit pictures of themselves or friends in trees, and they are posted with the story behind them (if provided) and commentary from changelyng. Babies at Concerts has the tagline "Pretty much the cutest thing next to puppies rolling in ice cream." If you enjoy either music or babies or both (and who doesn't?) you'll find something to make you smile in this picture blog. 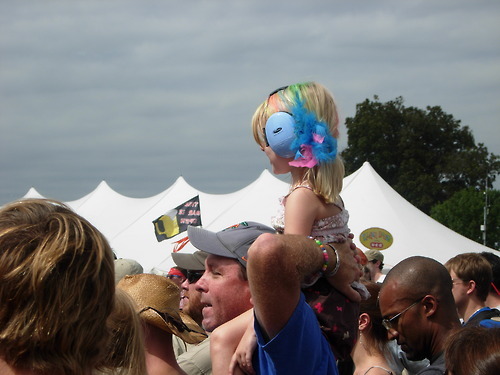 The photo shown was taken at the Austin City Limits Music Festival in 2009 and submitted by Kimber. 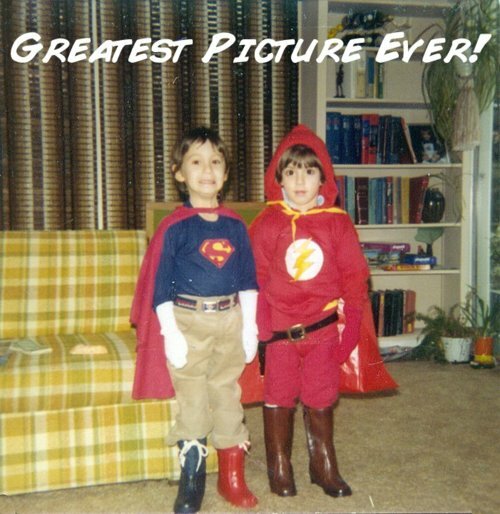 Nostalgia blog Growing Up Heroes has photographs of children in their superhero play clothes or costumes, often submitted by those children themselves years later. Jeff Gurwood contributed this photo of Superman and the Flash. I love Superman's white gloves and the Flash's cowboy boots! Do you feel the need to keep up with what's going on in the world of puppetry? Then check out Puppet Vision. Curated by a Toronto puppeteer named Andrew, this blog has news stories, videos, profiles of puppeteers from all over, and more about the art of puppetry than you ever thought you needed to know! It even has links to more puppetry blogs. 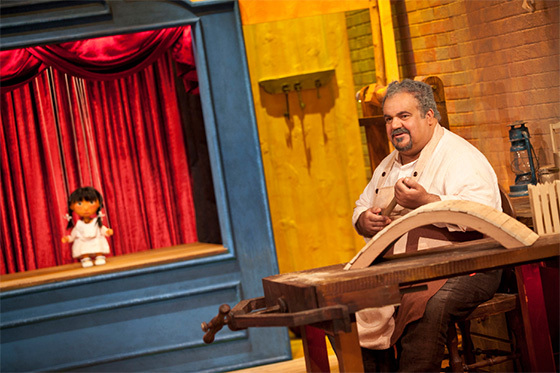 The picture here is from a post on the first puppet show produced by Al Jazeera Childrens Channel in Qatar. Posting pictures of cats is what 95% of bloggers do. To be a real niche blog, you have to have a narrower theme. 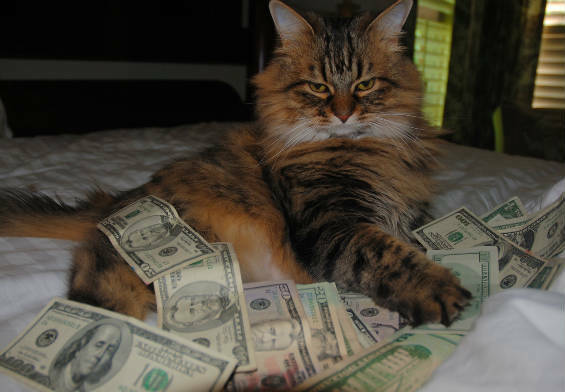 Ca$hCats fills the bill, so to speak, as all the pictures contain both cats and cash. The cats, however, don't seem to care. It's all about the Benjamins, so this blog will take your photo submission. The same idea is behind OMG Cats in Space!!! except that the cats in this picture blog appear to be quite excited to be in space. They are all animated gifs of cats superimposed on celestial backgrounds, and the site has an infinite scroll so you can conceivably see them all at once. Cosmic. News Cat Gifs! is obviously run by a journalist who prefers to remain anonymous. He/she does have an extensive collection of animated cats to explain the business. The gif shown here is titled "When someone complains about breaking Olympic news on Twitter." If you prefer your news silly, but without cats, here's something for you. Onion-like Headlines in Real Life is exactly what it says on the tin, but most importantly, those headlines are all links to the story to which they refer. Otherwise, you'd think they were made up of whole cloth just for the blog. This headline goes to a story that we had in the Morning Links a week or so back. It was a slow news day, I guess. Okay, most of this list is for those who are looking for something besides Olympic coverage, but there are a few blogs that are there only for the London 2012 Olympics, and that's a pretty narrow niche. They probably won't be updated much after the Games are over. 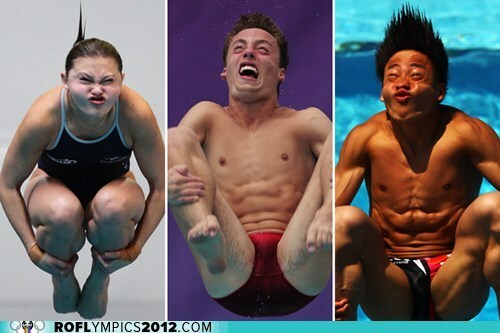 One is ROFLympics 2012, which is part of the Cheezburger network. Strangely, there is rather little "rolling on the floor laughing" content, but instead a lot of news, scores, and results updated quite often. Oh yes, there's the occasional funny photo, as you can see. Warning: this blog contains spoilers. Fourth-Place Medal is a subsidiary of Yahoo News that looks at the lighter side of the Olympics, plus trivia that is just a little too obscure for a full news story. 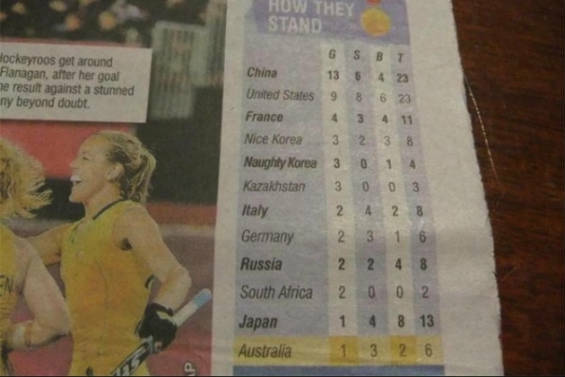 For example, where else would you hear about a newspaper that published results featuring North and South Korea labeled as "Naughty Korea" and "Nice Korea"? Still, I'm glad to find a breaking story about an Olympic athlete we met last week. Warning: this blog contains spoilers.